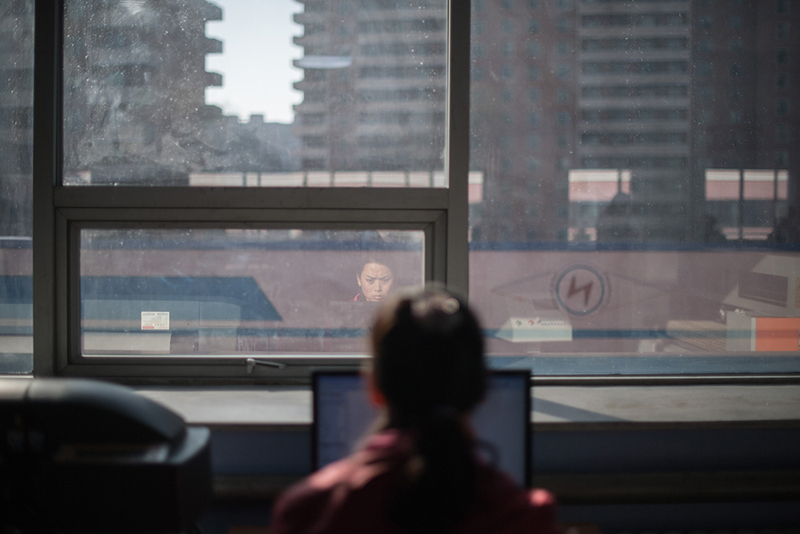 A woman is reflected in a window as she uses a computer at the 'Pyongyang Bag Factory' in Pyongyang, Feb. 18, 2017. Traders in North Korea have shunned email as a method of communicating with their foreign partners because the state exacts exorbitant fees for sending and receiving messages, and their correspondence is subjected to heavy scrutiny by official censors, according to sources who do business in the region. A Chinese merchant who spoke on condition of anonymity told RFA’s Korean Service that traders in North Korea choose to avoid communicating with foreign clients via email because of the challenges they face in the notoriously closed country, despite the impact it has on their business. In order to establish an email link with a North Korean trader, foreign partners must first “register their email address with North Korea’s security authorities to get approval,” the source said. Traders in North Korea must explain to authorities whether their foreign partners are “friendly” towards the country and why it is necessary to communicate using email, but even if given approval, the two sides face additional complications. “Even if emails addresses of foreign companies are successfully registered, North Korean partners cannot directly receive the emails that are sent to them,” the source told RFA. The traders must then pay a fee to the authorities as recipients of an email, he said. “I heard from a North Korean trader that if we send a facsimile to Pyongyang, the recipient will have to pay 4 euros (U.S. $4.26), but recipients have to pay more for emails,” he added, without providing an amount. When a North Korean trader replies to a foreign partner’s email, they must first submit the content of the message to Pyongyang’s communication center, where an officer will censor it before sending it on to its final destination. Replies cost even more money to send than receiving emails, the source said. “All of the expenses should be paid by North Korean trade companies, since the correspondence is part of official business, but in North Korea, individual traders must cover the costs,” he said. A second Chinese merchant, who also asked to withhold his name, said that mainly Chinese foreign companies operating inside North Korea are also affected by challenges associated with using email and have sought to set up their own Internet service to circumvent requirements. “Foreign companies operating in the Rason Special Economic Zone can establish their own internet service and communicate with their home countries by email,” the source said, referring to the warm-water port in the northeastern part of North Hamgyong province bordering China and Russia. Authorities have long tried to block various forms of information from entering North Korea in an attempt to keep unwanted foreign influences from seeping into the isolated nation. Leader Kim Jong Un is believed to be particularly sensitive about news of the outside world getting into the North because of its ability to undermine his regime’s propaganda efforts and threaten his support base—made up largely of the country’s elite. Local phones and internet access are restricted to the North’s own networks, though, as Pyongyang seeks to prevent the spread of information from abroad. Reported by Joonho Kim for RFA’s Korean Service. Translated by Soo Min Jo. Written in English by Joshua Lipes.